That was HILARIOUS Butterscotch! If you trust my lowly opinion! I really liked it! Note: this picture is from Mongo and the Candids thread. "Lana, where did you get that bracelet?" "Then why does it say 'Made in China' ?" Shame on you for talking about your little brother that way! For shame! *Miss RayMilland*: You're opinion is anything but 'lowly', as I'm sure you know. And I know you know something about little brothers too. We remember that imposter episode. No wonder you liked Butter's caption. The brunette: Ahh...somebody shoulda told ya, dearie. A push-up bra helps only when there's something to push up." "yeah, an I'm drinkin' all of 'em...ya hear?" #11--"Tonight on Hollywood Caught on Tape...The first known siting of the infamous Celebrity Jewel Thieves. He distracts the lovely ladies with his dazzling smile and lots of sweet nothings in their ear while she removes the jewelry without them noticing a thing. This crime ring is BUSTED!" "Lana, I want to say, that you look Mahvelous!!!" "Now, dear, you've worn it long enough. Now let her have it for awhile. Why don't you have a few more drinks and you won't even care." "Smile and put up with it, Ladies. Its an even bigger pain in the **** when the photogs are not there. Please note that there is an important prop associated with the gentleman in the center of the picture. I mention because it is rather hard to see. Thanks. "You know that old joke about staying in a hotel for a whole week and eating peanut butter sandwiches because you didn't realize meals were included in the price? Well..."
12 "Get rid of this old deaf coot and I'll teach you some hanky panky." "How would you like to audition for The Bride of Frankenstein ?" "You wouldn't believe all the things I can hide in this hair!!". oh the contrary! i love your opinion, thank you! i wasnt talking about MY little brother......laffite do you happen to have a little brother? if you do...oopsey daisies! heehee! handsome man:"you look lovely tonight, my dear"
man who cant hear:"what? i dont see a deer anywhere!" thats all i could think of. see what you can make of this beautiful sentimental scene. it isnt funny, but i tried. "Well, its nice meeting you, Maam, but The Murphy-Conners wedding is in the chapel at the other entrance. This the Thomas-Simmons wedding. 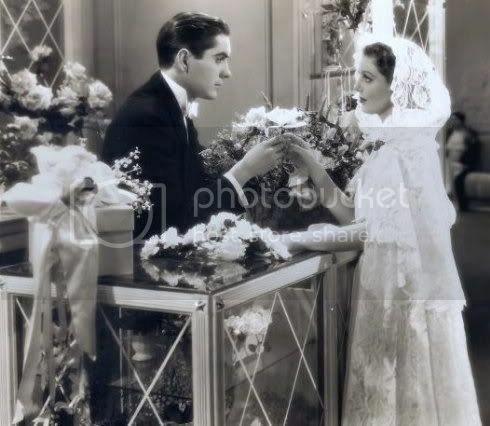 Tyrone Power and Loretta Young?? Why, ButterScotchGreer, you clever thing you, that is quite good...honestly! You brought in all the elements of the picture, including the hearing device. That's what a good caption does, it brings in everything. I think you are pretty doggone good at this. Well, you said it hard was to say. I thought you had a little brother you wanted to get rid of. Man: Darling, why are you looking at me like that? Woman: I'm still waiting for you to propose. #13 I agree.. having a live mannequin display IS a great way to attract customers into our flower shop! But we should have hired somebody to do it for us. You and I are the only two employees here, and if we're stuck holding this pose...who's going to run the cash register? Girl: The weather in London is always foggy. Man: Except when the skies are clear. Girl: Ok, your orders are to blow up the Manchester Street Bridge. Man: But there is no Manchester Street Bridge. Girl: That doesn?t matter, those are your orders. If you fail to carry them out, you will be sent to a concentration camp. Man: I don?t know how much longer I can keep meeting you like this. My supervisor is becoming suspicious since you never buy any flowers. Girl: Ok, give me a set of violets. Man: But that is the code phrase that identifies Agent X3. Girl: I am Agent X3. Man: You can?t be, because I?m agent X3. Girl: Impossible! Berlin will hear about this, you incompetent fool! Man: You?ll never make it back to Berlin. Man: My men will kill you first. Girl: You can?t kill me, I?m being watched by my bodyguards. Man: But those are my men, X7 and X12. Girl: No, they killed X7 and X12 and are dressed in their clothes. Man: Would you have dinner with me tonight and attend a concert at Albert Hall? Girl: I might, if I can get rid of X7 and X12. Man: Ok, I?l pick you up at the north entrance to Waterloo Bridge at 8. Girl: But we just blew up Waterloo Bridge. Man: My, that?s rather awkward. Girl: How about meeting me at Victoria station, at the Southampton platform? Man: Sounds good to me. How will I recognize you in the crowd? Girl: I?ll be wearing a red dress and carring a green hat box.